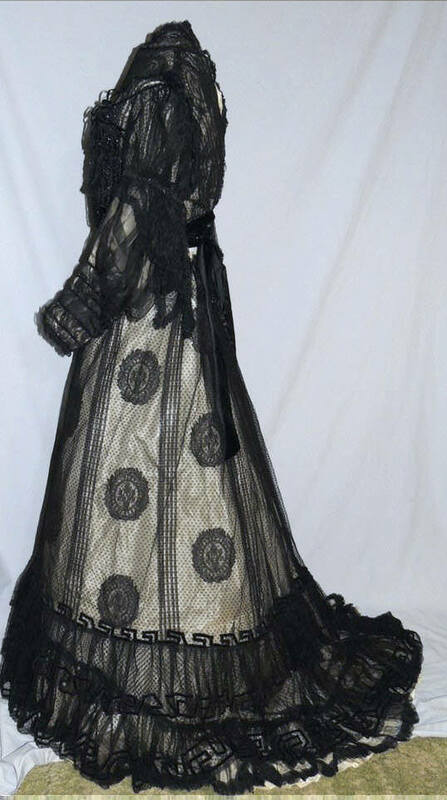 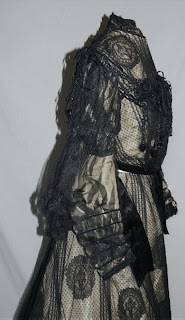 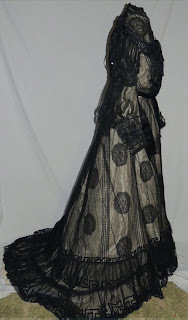 This lovely Victorian gown is made from black lace. 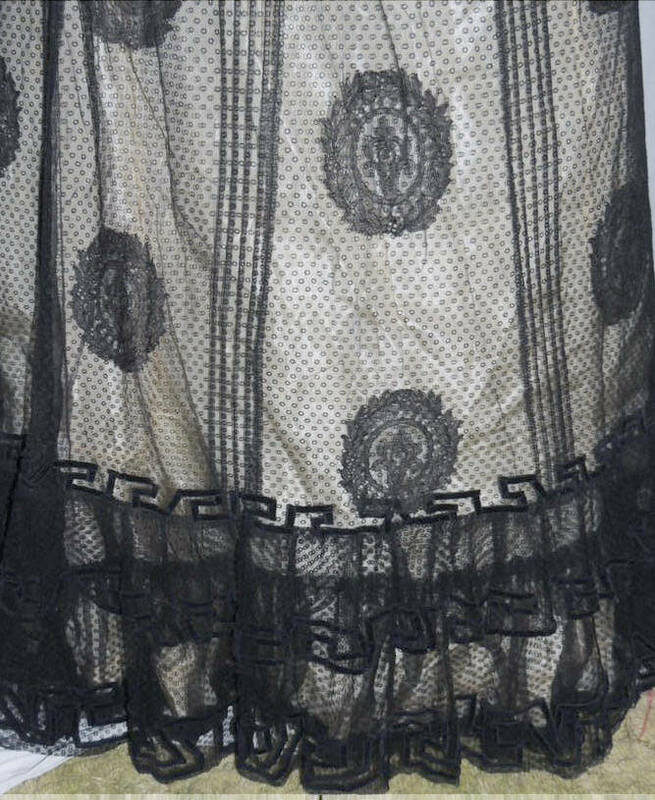 The lining is in poor condition and needs to be re-lined, but the lace is in overall excellent shape. 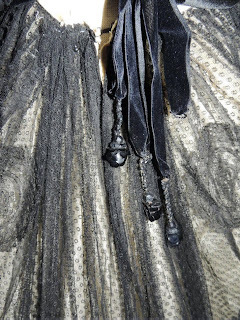 The bodice hooks down the back, it has loops of narrow black velvet ribbons and swags of large facketed black beads. 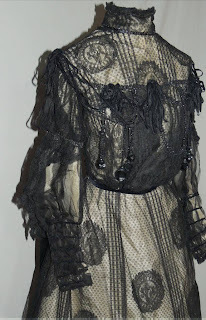 IT has dangles with large sequin clusters on the ends across the front and in the pouffs of the sleeves. Over the left breast there are 6 dangles, then 3 just off center on the rigth side and 1 on the far right, it is not evenly spaced which gives an interesting look. The sleeves are puffed on the top, they have beads around the upper arm and a long, pointed lacy flounce below the band of beads. 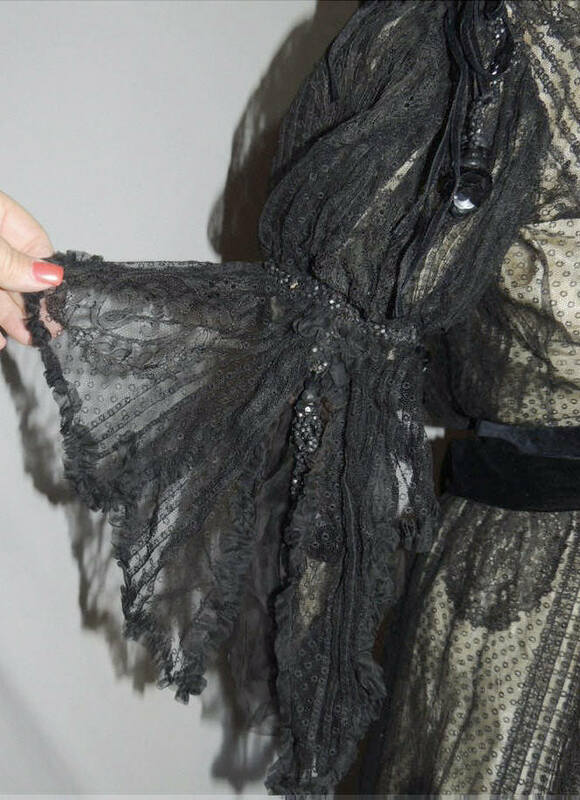 On the back of the sleeves there are loops of the beaded trim and dangles with the cluster of sequins, one is missing on one side. 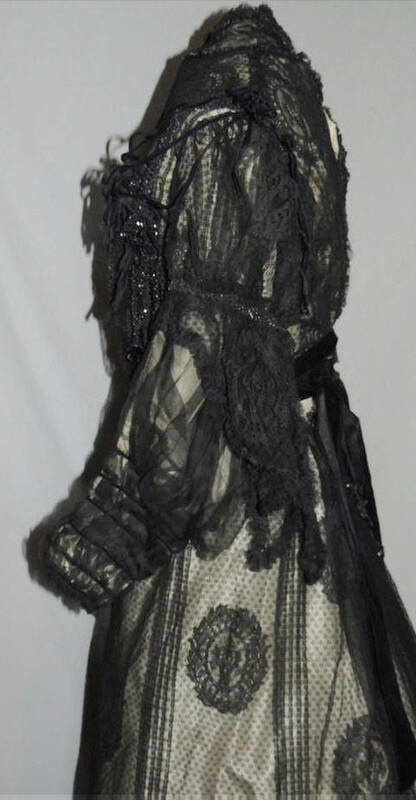 The pointed lace flounces are trimmed with narrow ruched silk chiffon around the edges, the lower sleeves are silk chiffon, banded around the cuffs with black velvet ribbon. It has wider velvet around the bottom edge of the bodice, it makes loops at the center back with the beaded dangles, 1 is missing here as well. 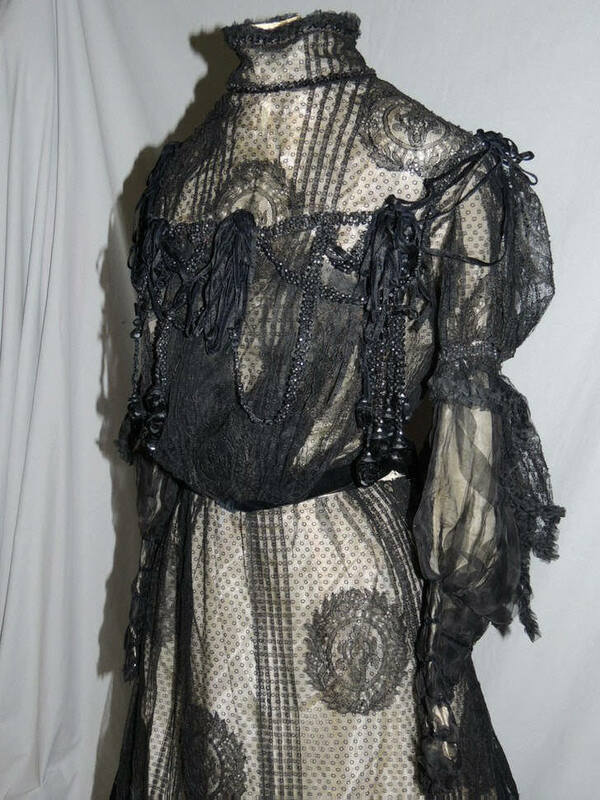 There's a small tear in the lace at the center front right under the collar and a seam of the lace is opened on the shoulder. 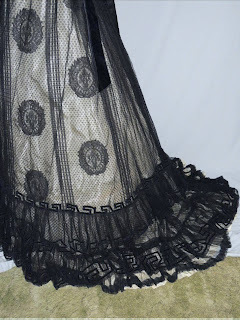 It measures 38 inches around the bust, across the back shoulder is 12 1/2 inches, around the collar is 12 2/3 inches and the waist is 25 1/2, it's about 18 1/2 inches long from the shoulder to lowest point in front. The skirt also needs a new lining, it has a narrow taffeta waistband and a wide silk velveteen ribbon tacked around the waist to tie in back, the velvet is Victorian, but I think added later. 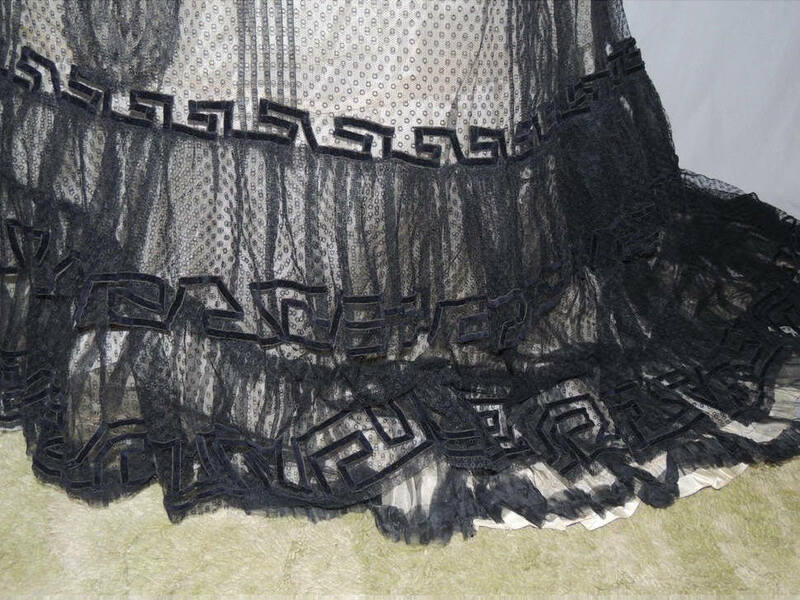 It's fuller in the back, falling to a train and has 2 ruffles around the hem trimmed with velvet ribbon in the Greek key pattern. The lace is backed with black chiffon, which is in good condition, it has a ruffle around the bottom edged with a narrow gathered ruffle on the bottom of the hem. The lace has a couple of tears coming down from the damaged waistband, but again, overall in very good condition. It measures 24 1/2 inches around the waist, hips are full, it's 41 inches long in front and 49 1/2 inches long in back. It's one of the fanciest and most interesting I have had in a while, restored, it will be stunning.